In a blender or food processor fitted with a steel knife. combine the garlic, ginger, pineapple juice, orange juice, soy sauce, vinegar and honey. Whirl until well blended. 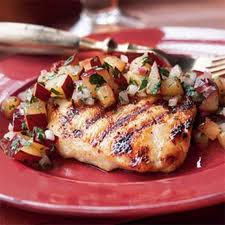 Place the chicken breasts in a large glass or enamel covered baking dish and pour the marinade over them. Cover the plastic wrap and refrigerate for at least 24 hours, turning the breasts occasionally to redistribute the marinade. Time allowance for final preparation: 20 minutes. Preheat the broiler, positioning the rack 4 inches from the heat. Transfer the chicken breasts from the marinade to jelly roll pans or cookie sheets. (The marinade may be saved, refrigerated for up to one month, and used again). Brush the surface of the breasts with the duck sauce, broil for 5 to 10 minutes, without turning until the breasts are firm to the touch. Time depends on thickness of breasts and heat of the broiler. Serve immediately. (The breasts may also be grilled over charcoal, but allow additional time to prepare the coals, which should be red hot but not flaming. Depending upon the fire's heat, turn the breasts after 5 minutes, brushing again with duck sauce.